Oscar Dewberry’s first visit to Ossabaw Island was for work ... and it was a pleasure. In winter 1957-58, Dewberry, a newly hired biologist with what is now Georgia DNR’s Game Management Section, helped capture deer on Ossabaw as part of project to restock whitetails across the state. The project had a lasting impact on Georgia’s deer population, restoring the herd statewide. The island had a lasting impact on Dewberry, setting him on a 34-year DNR career. This summer, in his first trip back in a half-century, he and his wife Bobbie toured Ossabaw with The Environmental Resources Network, or TERN, the Nongame Conservation Section friends group. Dewberry, 87, found “some things ... very similar,” particularly the marshes and roads. “But it was a lot more grown up,” he added, because in the 1950s Ossabaw was still private and home to free-ranging cattle, plus hogs, deer and a few horses. Each week that winter, except in December, he would leave Metter early on Monday, gather groceries and gas, guide a boat with other staff to Ossabaw, hunt deer at night by Jeep, spotlight and nicotine-filled darts, and crate the captured animals for stocking before leaving on Fridays. Crews stayed in a cabin beside a tidal slough. DNR’s Jack Crockford, developer of the Cap-Chur syringe gun and later the agency’s director, sometimes joined the crew, flying in and out using the beach as a runway. Dewberry doesn’t recall how many deer they caught. Records show that 428 were stocked in 1957-58 using deer from Ossabaw, Blackbeard and St. Catherines islands, plus Texas and other sites. He moved on to other projects the next fall, returning to Ossabaw once in 1965, all the while building a career that contributed to key restoration efforts including wild turkeys, Canada geese and wood ducks. 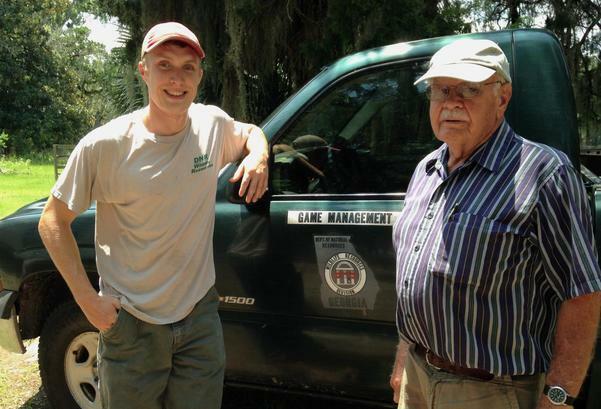 He retired in 1989 as supervisor of Game Management's southwest Georgia region, but still works with wildlife. Dewberry, who lives in Bainbridge, serves as a TERN board member, coordinates the Decatur County Audubon Christmas Bird Count and helps mentor young birders. From 1994-2010, he also did surveys and helped in developing the Breeding Bird Atlas of Georgia, now in book form. And he will always remember Ossabaw, including the February night it snowed and the occasionally harrowing trips to the island in a loaded 17-foot aluminum boat piloted by the new guy more familiar with river bends near his hometown of Tallapoosa than the swirling chop in the island shortcut called Hell’s Gate. “I have been out there when I wished I wasn’t,” Dewberry said with a chuckle. 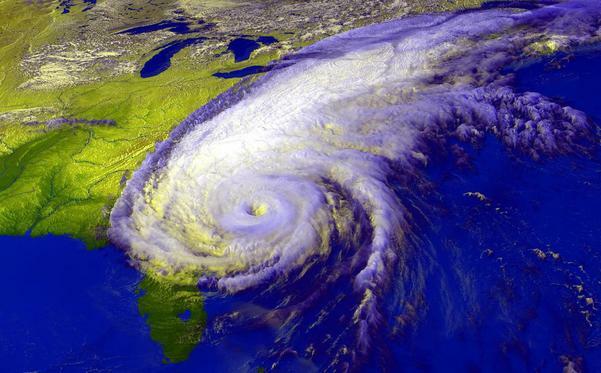 In Georgia, you cannot go through the summer without thinking about hurricanes, particularly during the peak of the Atlantic hurricane season, September through early October. Although these giant storms rarely make landfall along our coast, their devastating impact on lives and property is felt far from the storm centers. Likewise, although seldom mentioned by the media, even the hurricanes that come ashore far from Georgia can have a severe negative impact on wildlife, including the birds that visit our backyards. This is especially true for neotropical migrants, species that nest in North America and winter in the Caribbean and Central and South America. Neotropical migrants include the warblers, tanagers, catbirds, grosbeaks, thrushes, hummingbirds and others that spend part of the year just outside our backdoors. Read Terry’s full column for more on how these massive storms affect neotropical migrants, including stories from hurricanes Wilma and Hugo. 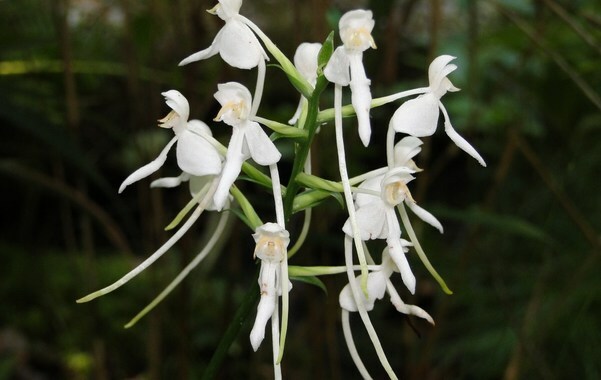 White fringeless orchid, commonly called monkeyface orchid in Georgia, has been proposed for listing as threatened under the Endangered Species Act. Although there are 58 known populations across five Southeastern states, including nine in Georgia, all of the populations are small, isolated and dogged by an array of threats, according to the U.S. Fish and Wildlife Service. Check out media coverage of Atlanta Botanical Garden and DNR work with white fringeless orchids. 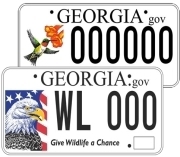 Georgia’s revised State Wildlife Action Plan has been handed to the Fish and Wildlife Service for review. Involving more than 100 sources, from landowners to conservation nonprofits and wildlife agencies, the revision of the original 2005 plan mines the best available data to update the comprehensive strategy that prioritizes wildlife conservation needs and recommends ways to address them. An approved State Wildlife Action Plan is required for state wildlife agencies to receive State Wildlife Grants, the main federal funding source for states to conserve nongame. Georgia receives about $1.25 million a year. Georgia author Janisse Ray is the keynote speaker at the annual Georgia Prescribed Fire Council meeting, Sept. 29 at the University of Georgia’s Tifton Campus Conference Center. Ray (“Ecology of a Cracker Childhood,” “Drifting into Darien” and others) will lead a diverse lineup of speakers focused on promoting the vital role of prescribed burning. The meeting is open to the public. Prescribed fire also will be a hot topic at the Sept. 26 Forest Fun Day at Sandy Creek Nature Center in Athens. The free event featuring music, hikes, forestry expects and equipment – including a Nongame Conservation Section fire engine – marks the kick-off the center’s managed forest. More free outdoor fun such as adventure days and kids fishing events will mark Georgia’s celebration of National Hunting and Fishing Day Sept. 26. “If you are interested in outdoor activities such as hunting, fishing and wildlife watching, but don’t know how to get started or want to improve, make plans to attend one of these events,” said Dan Forster, DNR Wildlife Resources Division director. 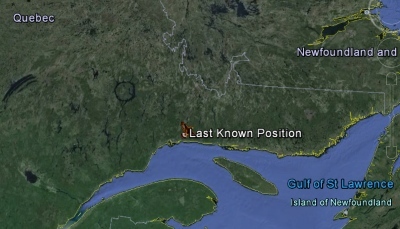 The golden eagle fitted with a satellite transmitter in middle Georgia this winter is still hanging out near the Gulf of St. Lawrence (“Rare eagle tracked,” Feb. 25). West Virginia University’s Dr. Tricia Miller, leader of the project documenting eastern North America’s golden eagles, said the bird could begin migrating next month, although some don’t head south until November or later. The return trip could take more than a month for the Georgia-tagged eagle, nicknamed Devil’s Backbone after the hunt club where it was caught and released. Caught a second time stealing sea turtle eggs, Lewis Jackson again pleaded guilty. A DNR technician noticed eggs missing from a Sapelo Island nest July 6. Rangers arrested Jackson, 60, of Brunswick, the next day as he tried to leave Sapelo with a cooler full of loggerhead sea turtle eggs. Convicted for the same crime three years ago (“Sea turtle eggs taken,” June 13, 2012), he faces a maximum of five years in prison and a $250,000 fine. Fall migration shorebird surveys have documented about 65 banded red knots so far on the Altamaha River. About a third have been seen only once in Georgia this season, suggesting a fairly high turnover rate as they move through the state, according to the collaborative between DNR, the Fish and Wildlife Service, Manomet Center for Conservation Science, and the Center for Conservation Biology. Fifty gallons of non-toxic fluorescent red dye released into lower the Altamaha Aug. 31-Sept. 1 are helping Georgia Southern University researchers explore the river’s impact on the ecology of the near-shore Atlantic Ocean. The dye plume is being monitored as it moves along the coast and offshore. Live mussels including the Alabama rainbow and Coosa creekshell, two species petitioned for federal listing, were collected by Nongame Conservation Section staff during recent sampling in the Cedar Creek watershed, part of the upper Coosa River near Cedartown and Cave Springs. Some sites had high-quality habitat and could be suitable for reintroducing or adding to the mussel populations. More than 120 acres surrounding restored grassland at Panola Mountain State Park were treated for invasive plants, varying from Japanese hops to tree of Heaven, by Nongame Conservation senior biologist Nathan Klaus and an AmeriCorps crew sponsored by Georgia State Parks and Historic Sites. White-haired goldenrod, found only in eastern Kentucky, will be delisted under the Endangered Species Act, while the Kentucky arrow darter, also found in the region, is the focus of a new candidate conservation agreement. Clarification: Commercial fishing-related mortalities have accounted for about 26 percent of sea turtle strandings in Georgia this year. A brief in the previous Georgia Wild did not specify the type of fishing. Names in the news: A paper resulting from Bess Harris’ UGA master’s thesis, “Overwintering Ecology of Juvenile Gopher Tortoises,” was published in the August issue of Herpetological Conservation and Biology. Harris' work was funded in part by a grant from TERN. The U.S. Army Corps of Engineers gave Sgt. Mike Barr of the DNR Law Enforcement Division its Commander’s Award for his public service and contributions to water safety at Lake Allatoona, where he was previously based. First Lady Sandra Deal received the President’s Award from the National Association of State Park Directors for her support of Georgia State Parks & Historic Sites. Winners of the Friends of State Parks & Historic Sites inaugural awards included James Maund of Sapelo Island's Reynolds Mansion for customer service and Crooked River State Park manager Joe Bradford as manager of the year. Bird banding at Panola Mountain State Park: 6:20 a.m. Sept. 20; 6:30 a.m. Oct. 4; 6:50 a.m. Oct. 24; 6:50 a.m. Oct. 31; 6 a.m. Nov. 14, 21; 6:30 a.m. Dec. 5, 19. Charlie Muise, Georgia Important Bird Areas coordinator. Sept. 29-Oct. 1 – Birding Weekend at Reynolds Mansion, Sapelo Island. Register by Sept. 15. Sept. 30: Integrated Management for the Control of Chinese Tallow (free webinar), 1-2 p.m., Southern Fire Exchange (presenter: Lauren Pile, PhD candidate, Clemson University). Registration required. 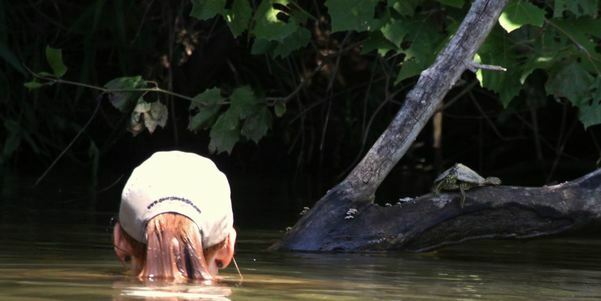 Nongame Conservation technician Rebecca Byrd sneaks closer to an Alabama map turtle on the Coosa River. Byrd joined senior wildlife biologist John Jensen and volunteer Greg Geer for a basking turtle survey focused on Alabama map turtles, petitioned for federal listing. Results will help the U.S. Fish and Wildlife Service’s decide whether to list the species. 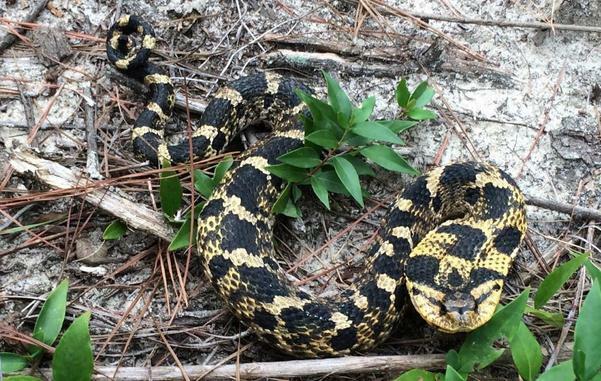 Below, nongame staff found this eastern hognose snake during a recent gopher tortoise survey in Randolph County.